Easy to use kitchen timer alarms on the Hour and Half Hour. 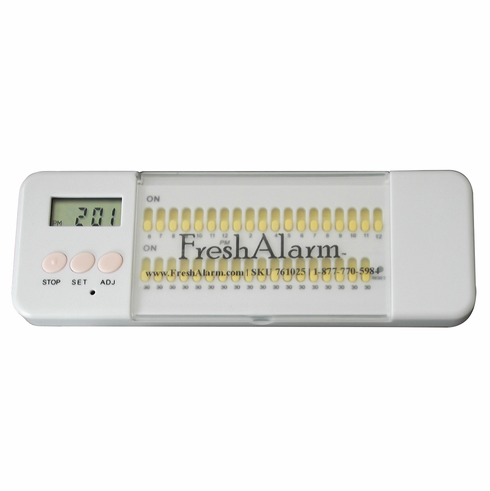 Fresh Alarm Restaurant Timer complete with Maintenance Kit (SKU 760125). This easy to use kitchen timer alarms on the Hour and Half Hour. No reset required - alarms auto repeat every day at the same time. Never forget to rotate your food or perform kitchen quality checks again with this Easy-To-Use and Practical Fresh Alarm timer. Set up to 37 daily alarms. This 'Kitchen Manager' is always on duty. Complete Timer and Maintenance Care Kit includes everything you need: Timer with Batteries installed, Mounting Fastener, Maintenance Kit with Batteries (2 extra sets = 6 alkaline batteries) and small screw-driver for easy battery change. Easy to Set: Select the times when you need the alarm to go off every day. Alarm settings are available by simply sliding one or several of the 37 switches on the HOUR and/or HALF-HOUR from 6:00 AM to Midnight to the on (up) position. NO ALARM RESET required. All alarms reset automatically at midnight and repeat at the same time every day. Example: KFC in The Dalles, Oregon sets all alarms from 12:00PM (noon) to closing time 9:30 PM (20 daily alarms / alarms every 30 minutes). When the Alarm is heard ('every 30 minutes') a Quality Check is performed. The person performing the quality check then presses the STOP button and the alarm is turned off (regardless of what the operator does the alarm will sound at the same time tomorrow). If the STOP button is not pressed within 4 minutes of the scheduled alarm, a VISUAL INDICATOR (flashing) is turned on. Battery: 2 x AAA (included) Alkaline batteries are recommended. Fresh Alarm� is a registered trademark. Battery Life: 2 months (2 extra sets of batteries are included in maintenance kit). Size: 6 1/4" x 2 1/8" x 1/2". Weight 4 oz (timer only).